Many home developers have embraced the open floor plan design when building homes. The design has gained popularity among homeowners and reports from the NAHB (National Association of Home Builders) say that close to 84% of single family homes being built have utilized this design. 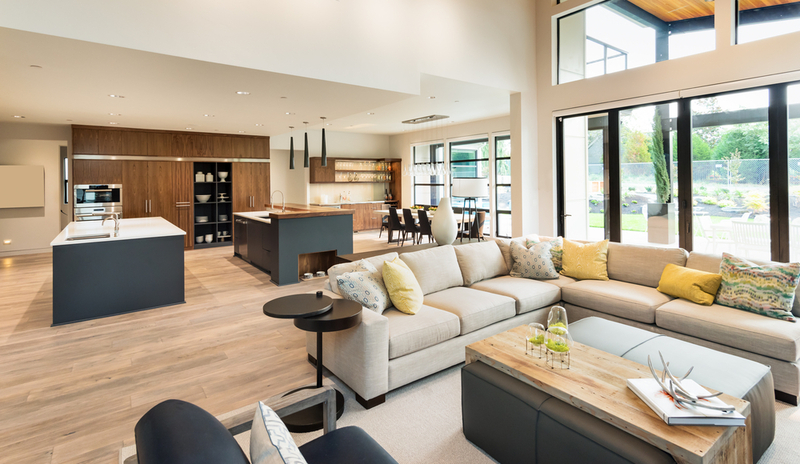 Check out the pros and cons of an open floor plan home to determine whether or not it’s the best design you would like for your current or future home. Below are the reasons why open floor plans have become very popular. It makes the house feel and look bigger since the square footage of the house is not cut into smaller cramped quarters. Hence, there is no unused space in the house. More lights flows into the house when there are no walls. Light coming into the house through the windows illuminates throughout the entire house. This eliminates any dark interiors present in the room and there will be no need for artificial lights during the day. With an open floor plan, there is more social interaction in the house. One can easily interact with someone who is in another part of the house. This is a very efficient way of entertaining guests. Depending on the home owner’s needs, open floor plans give the flexibility to be extra creative in decorating the home and coming up with different furniture arrangements. Space can be redefined into different styles without undergoing major interior architectural changes. Cons of open floor plans. It’s good to look at the other side of the coin when it comes to open floor plans. Below are the challenges of dealing with an open floor design in your home. Dealing with the heat and the smell when cooking. You will need to have a heavy duty ventilation system or else your guests will be dealing with a lot of heat, smoke and smell while you are cooking. If you are that type of chef who likes cooking with no interruption or your hosting style is a little more formal if you usually hire professional cooking services for parties, you might have to forgo an open floor plan. Open floor plan comes with unrestricted social interaction. Just like teenagers, some of us will want to have private moments. This cannot be achieved with an open floor plan. This makes it hard if you have a family with kids who are teenagers. You can’t read a book privately without interruption unless you are living alone. You can’t escape dealing with noise being made by kids, the TV, the dishwasher, or music. Since there are no walls to absorb the sounds, you better be ready to buy some ear plugs. Inability to hide the mess. In case a guest drops by, there is no way you can hide a messy living room. Unlike the traditional design where there are walls and doors, the open floor plan will allow the visitors to view everything – even your clutter. Do you have a question about open floor plans? Click here to contact Stacy and Nicole today!